Louis Braille, born January 4, 1809 was accidentally blinded in one eye at the age of three. Within two years, a disease in his other eye left him completely blind. When he was fifteen, he developed an ingenious system of reading and writing by means of raised dots. Today, in virtually every language throughout the world, Braille is the standard form of writing and reading used by visually impaired persons. For decades, the number of Braille users has been on the decline. While there are many reasons for the decline of Braille, technology that converts text to speech has been identified as a major factor. 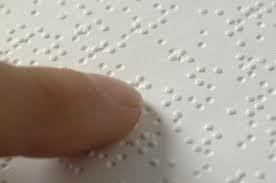 However, over 150 million people continue to use Braille around the world today for a multitude of reasons. Below, I am adding a picture of the Braille allphabet and a document in Braille for those that may not be familiar with it.